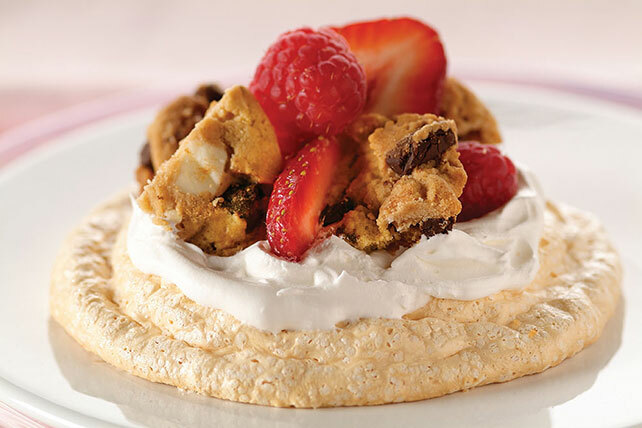 Enjoy this Berry Meringue Treat made with strawberries, raspberries & chocolate chunk cookies. These Berry Meringue Treats take only 15 minutes to prepare. Preheat oven to 325°F. Beat egg whites in medium bowl with electric mixer on high speed until soft peaks form. Gradually add combined sugar and baking powder, beating until stiff and glossy. Spoon or pipe into 8 (4-inch) rounds on parchment-covered baking sheet, building up sides of each circle to form a shell. Bake 20 to 25 min. or until lightly browned. Cool completely on baking sheet. Spoon whipped topping into "tart" shells just before serving; fill evenly with the cookie pieces and fruit. Balance out your choices throughout the day so you can enjoy one of these treats. Stir 1/4 tsp. vanilla or almond extract into meringue mixture before spooning onto baking sheet. Prepare as directed, using any variety of chocolate chip cookies.